Send this Bustling Collection of Lambent Blossoms as a season-special symbol of your greetings to the most valued person of your life and let music of merriment ring within the individual’s mind. 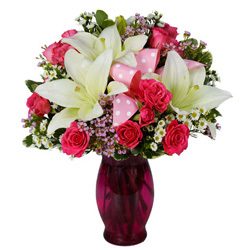 3 wondrous Yellow Lilies and 10 pristine Red Roses are showcased in this Collection. Note: Vase is not included. Send this Bustling Collection of Lambent Blossoms as a season-special symbol of your greetings to the most valued person of your life and let music of merriment ring within the individual’s mind. 3 wondrous Yellow Lilies and 10 pristine Red Roses are showcased in this Collection with Small Cadbury Celebration. Note: Vase is not included. Send this Bustling Collection of Lambent Blossoms as a season-special symbol of your greetings to the most valued person of your life and let music of merriment ring within the individual’s mind. 3 wondrous Yellow Lilies and 10 pristine Red Roses are showcased in this Collection with 1/2 kg Chocolate Cake. Note: Vase is not included.